Well, typical to our methods we have gone off and started a new project (we have been working on our other started projects too!). We decided to make a mud pizza oven for our daughter's birthday in mid august. 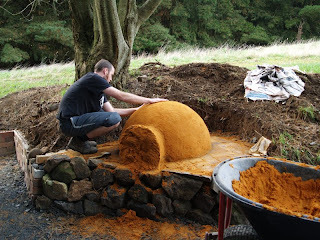 On saturday we mixed up the first layer of clay to put over the oven. 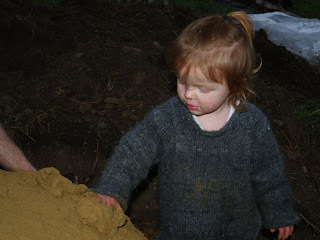 It was fun and a bit of a practice run for when we start making mudbricks for the house. 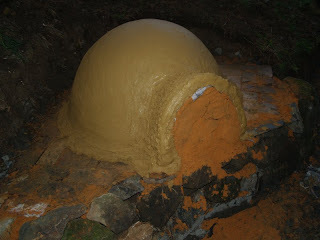 First we built a dome out of sand and shaped it how we want the oven to be. Then we mixed clay, sand and water on a big sheet of plastic, till it changed consistency. 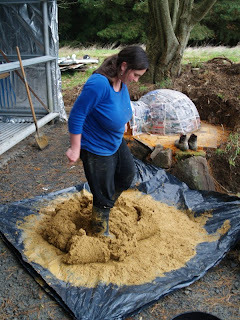 Next we applied the clay mix to the sand dome, which we had covered in wet newspaper. Our mix was a bit wet, so we were not able to apply it like little bricks. This first layer ended up being about 2-2.5cm (an inch) thick. We will add another layer of clay of a similar thickness after a week or so. After the photo was taken we put finger indents all over the surface to help the next layer stick, and also increase the surface area so that it will dry better. Then there will be a thick layer of clay, sand and straw, and then a render. Once its fairly dry we can dig out the sand, and hope that the whole thing wont cave in.... Then it'll be yummy wood fired pizzas every weekend (until the novelty wears off!). Wow! This is sooo interesting! Are you building this based on instructions, or winging it?? Woodfired pizza is the best. What a great birthday present! I love that you are all working on it together!